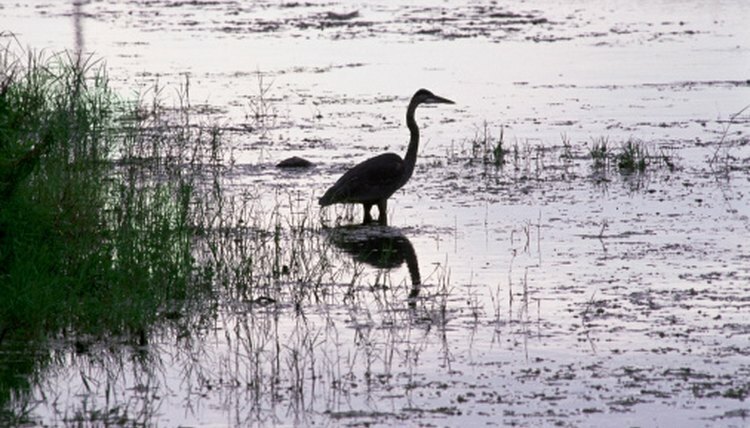 Herons of North America make their homes in marshy wetlands, swamps, rivers and lakes. They are drawn to these environments because of their diet, which consists of fish, aquatic insects, frogs, turtles and crustaceans. Birds in the heron family are physically adapted to be efficient hunters. Their graceful body types enable them to patiently pursue and swiftly capture their prey. Herons are also referred to as egrets and Ibis but they are all members of the Ardeidae family, which contains 64 species worldwide. The best known of the herons in North America is the great blue heron. Other American species are the snowy egret, great egret, tricolored heron, green heron, black-crowned night heron, yellow-crowned night heron and white ibis. Hunting techniques of the heron differ according to its environment. Favored areas for the heron are inland and coastal wetlands, subtropical swamps, rivers, lakes, urban parks and ponds and marshes. Herons in different regions use more active hunting strategies than others but all make use of their extensive beaks and long legs. Hunting methods have been divided into categories such as stand or stalk feeding, disturb and chase feeding, and aerial and deep water feeding. Stand or stalk feeding methods include the "stand and wait" technique — standing motionless until food appears, and the "walk slowly technique" — a slow motion pace toward food. Disturb and chase involves a "walk quickly" technique — moving quickly to flush out food and "hopping" — jumping and flying to prey. Aerial and deep water feeding includes "hovering stirring" — patting the water while flying, and "dipping" — catching food in flight. 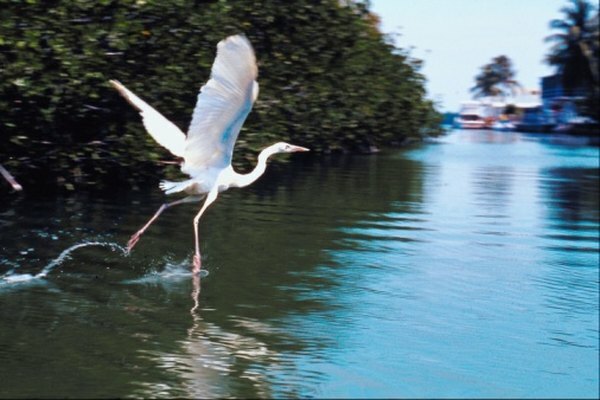 Certain physical adaptations contribute to the heron's hunting success. All herons have large beaks with sharp points for spearing fish. Beaks are also utilized to stir the water and attract fish via an opening and closing movement. Flying insects can be snatched from the air with the beak or used in prodding debris. Diving into the water to stab at food is made easier by the aerodynamic shape of the beak. Long legs aid in wetland hunting. Leg length allows the heron to crouch or stand upright for an efficient feeding posture or hop toward moving food. Feet are utilized in vibrating water surfaces, raking litter and paddling to perturb prey. Heron feet are also used to disturb the water while hovering above or in landing on the water, which enables it to stab at the food beneath with the beak. Herons have large wing spans, also used in hunting. Flicking the wings back and forth, extending and retracting, and raising and lowering the wings stirs prey into activity. Wings are obviously used in low flight forays, catching insects and hovering and diving. Other adaptations of the heron in hunting are its large eyes, which give it binocular vision and its S-shaped neck for greater striking strength. These traits have given the heron its graceful appearance and efficient hunting capabilities.